One of the most popular tower defense games of all time, Fieldrunners has been charming and challenging players on the iPhone, iPad, Android devices, the PSP, PlayStation 3, and the Nintendo DSi since 2008. Subatomic Studios is finally ready to release a sequel, giving fans only a month to get their affairs in order. Featuring news weapons, more than 20 hand-painted-levels, and hordes of new enemies to defend against, Fieldrunners 2 is due out for the iPhone at the end of June, with an iPad version following after. And once that's out of the way? If the success of the first game is any indication, it'll be everywhere. 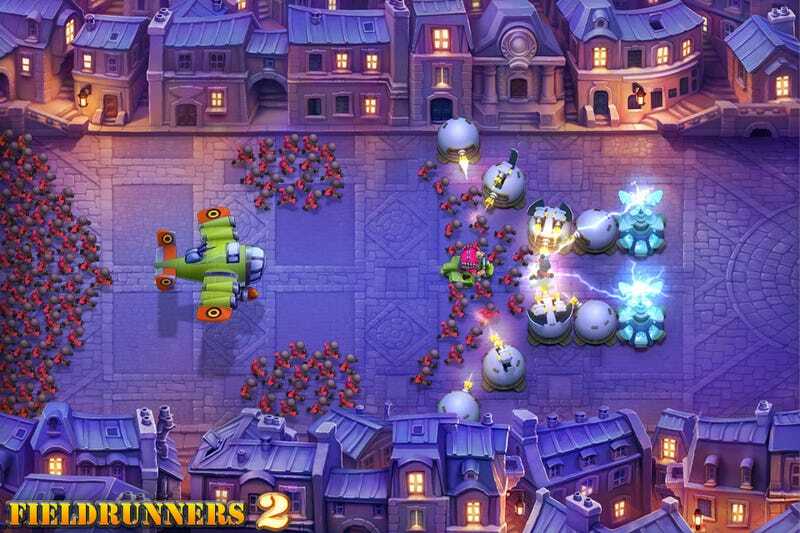 You might even be able to run Fieldrunners 2 on your internal organs, though it might require jail breaking. The standard survival and time trial maps are joined by puzzle and sudden death maps, incorporating more than 30 different enemy types swarming about your defenses like a swarm of hungry, man-eating antelope, which probably don't exist. In short, when this game arrives, I might disappear for a little while. I might be in the bathroom. No, I won't answer the door. It's better for both of us. Stay tuned to the Fieldrunners 2 website for more information.